Today the weekly Whistler Real Estate update comes to you from the shores of Lake Chapala in the sunny State of Jalisco, Mexico. A mix of old world charm and a new developments, the area is home to about 10,000 Canadians which represents the second largest group of Canadian retirees after Florida. Attracted by the low cost of living and an average annual temperature in the mid 70's, it is easy to see why this part of the world will continue to grow in popularity with Canadians looking for a warm place to retire. 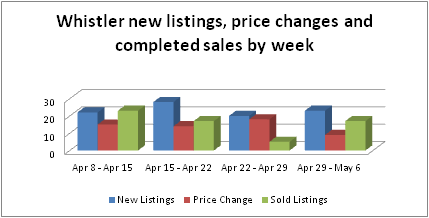 This past week the Whistler market saw a increase in new listings to 23, from the previous week's total of 20, a decrease in price changes from 18 to to 9 and and increase in completed transactions from 5 to 17. The sales consisted of 3 chalets ranging from $920,000 to $3m, 7 condo sales ranging from $50,000 to $481,000, 1 duplex sale at $753,000 and 6 townhomes ranging from $190,000 to $1.4m. To view these properties, please visit my weekly update page. Active chalet, condo, duplex, townhouse and vacant land listings for Whistler currently total 528. Please contact me with questions on these or other Whistler listings.